A health scare involving President Nursultan Nazarbayev is forcing Kazakhstan’s political class to confront a vexing question: what does the post-Nazarbayev future look like? The septuagenarian president returned to work on July 21 looking hale and hearty amid conjecture sparked by a German newspaper report that he had been hospitalized at a Hamburg clinic. That report was followed by a claim from his estranged former son-in-law, Rakhat Aliyev, that the president is battling prostate cancer. Nazarbayev’s office initially explained that the president was on vacation. But on July 25 presidential advisor Yermukhamet Yertysbayev – repeating previous leaks to journalists from an “informed source” – said that Nazarbayev had merely undergone a regular biannual check-up in Germany. 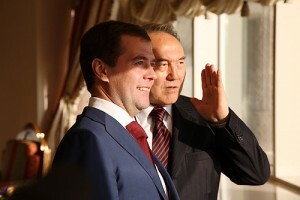 Nazarbayev, Yertysbayev added, is “full of strength and energy,” and intends to see out his presidential term to 2016. Amendments to Kazakhstan's constitution allowing the head of state to announce early presidential elections came into force on Thursday. Kazakhstan's lower house of parliament passed the bill on Wednesday, and on Thursday it was published by state media and entered into law. The move came after Kazakhstan's President Nursultan Nazarbayev rejected on Monday a referendum prolonging the president's term until 2020.